As Connecticut’s leading pool and spa experts, there are a number of attributes that we bring to our pool designs that set us apart from the competition. A swimming pool is a big investment and one that most homeowners take seriously and in order to honor that investment, we go to great lengths to distinguish each pool from any other. 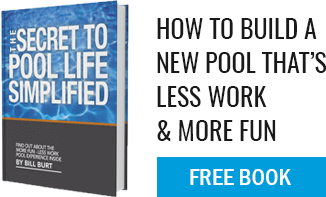 Here is a list of the key reasons why an Aqua Pool design is always a cut above the rest. We are always looking to incorporate cutting-edge design principles into our pool designs. Clean, geometric shapes with neutral-toned stone decking like in the picture below are a great way to create a pool that is both simple and grandiose at the same time. We also love to the think outside of the box when incorporating interesting features into a new pool design. Because pools are a great way for a homeowner to express some of their personality, we like to create features that match a lifestyle. Structures like the glass paneled, semi-opened cover in the picture below are a fantastic way to design even useful features in playful ways. Like most things, it is critical to get the landscaping right the first time. The way that we use plants and other natural design elements to set off the borders of your pool is critical in creating a welcoming and relaxing space. This picture is a great example of putting together native and readily available plants with a natural stone waterfall for a lagoon-like effect that is both clean and calming. There are so many other great reasons to look into our pool design schedule and process but the above components just reference a few. Take a look at out our online project galleries to get an even better idea of what we are all about. The sky’s the limit when designing a pool and we cannot wait to help you with it.